The Penticton Vees scored three goals in the third period as they came from behind to defeat the Surrey Eagles 3-2 in Game 4 of the Fred Page Cup Final at the South Okanagan Events Centre on Tuesday night. Wade Murphy, Ryan Gropp and Jedd Soleway scored for the Vees in the win while Anthony Brito and Nic Pierog tallied goals for Surrey. The series is now tied 2-2. The two teams played a very cagey opening period with only a handful of chances for either side. Surrey’s best opportunity came when Dan O’Keefe led the rush up the ice and got right in on goal but was stopped by Chad Katunar. For the Vees, both Cam Amantea and Sam Mellor had chances in front of the net and shot wide. Business picked up a little in the second with both teams generating more on the attack. Michael Santaguida made a pair of nice stops on Amantea and Travis Blanleil on the same play as he had to deny the rebound as well. Michael Stenerson nearly opened the scoring when he picked up the rebound of a Brady Shaw shot in front, but Katunar made a nice diving save to deny the Surrey forward. It was the Eagles that finally tallied the opening goal in the latter part of the period when Kevan Kilistoff forced a turnover in the right corner and passed to Brito at the left circle. The 20-year-old affiliate player placed a nice shot inside the left post to give Surrey the lead. 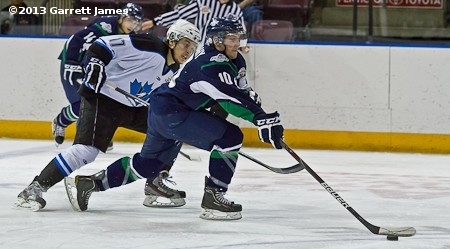 The Vees found their stride in the third and jumped on the Eagles early. Murphy tied the game in the first minute of the stanza with a shot from the left face-off dot that beat Santaguida between the legs on the power play. Shortly thereafter, Penticton took the lead when Gropp picked up the ricochet of a shot off the end boards and fired it into the goal. The Birds equalized when O’Keefe found Pierog with a nice stretch pass that sent the Surrey forward in alone on net, and he made no mistake, beating Katunar up high. The winning goal for the Vees came off a turnover at the Surrey blue line as a couple of Eagles got their wires crossed, resulting in John Siemer skating in on the left wing with the puck and feeding into the slot to Soleway who buried a wrister. For the fourth game in a row, the team that won the special teams battle came out on top as the Vees were 1-for-1 on the power play while Surrey went 0-for-3. Penticton out shot the Eagles 36-32. The teams will now head back to Surrey for a critical Game 5 on Thursday night. For tickets, call 604-531-GOAL (4625).